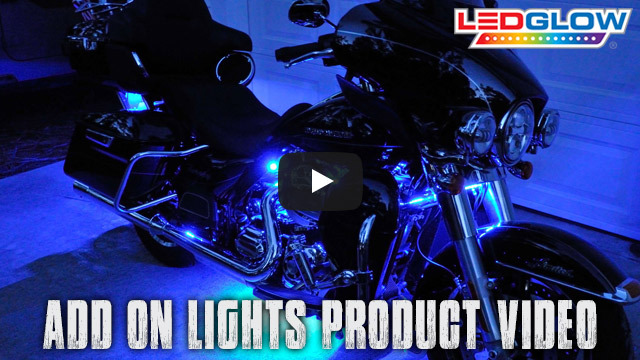 LEDGlow's Advanced Million Color Motorcycle Lighting Add-On Kit allows you to easily add additional SMD motorcycle lighting strips to your existing Advanced Million Color Motorcycle Lighting Kit. LEDGlow’s Advanced Million Color LED Flexible Motorcycle Add-On Kit allows you effortlessly add additional SMD motorcycle lighting strips to your existing Advanced Million Color Motorcycle Lighting Kit. These add-on kits are available in 2, 4, and 6 piece kits, and all feature 7" strips and include an expansion wire harness for easy installation. LEDGlow's LED lights for motorcycles include a one year limited warranty and free lifetime technical support. Easy to use and a GREAT product! I had previously ordered the Advanced Million color motorcycle kit and after putting all my lights on my bike, I felt like I was missing some spots. So I ordered this kit and they plugged right into my existing kit, (even comes with a expansion harness). If you need to add some more LED’s to your kit, this is the kit for you! Get it now! I purchased a mini kit with enough strips to do everything but the front wheel. I soon realized that the front wheel really needed to be done to complete the package. I ordered a two piece add-on kit. It worked extremely well. I put the strips under the fender (there was a convenient rail for mounting inside the fender) and ran the wires back to the mini unit. The kit came with a splitter so I didn't need to worry about having enough free plugs. My bike now looks absolutely amazing! You can't beat the price or the performance of these lights. I would definitely recommend them to anyone. But them! U will love them and even want more!